Just in case you don't follow me on Instagram then you might not have seen that I've gone over to blond[er] side. Technically it's balayage as I've still maintained my dark roots but to a long-term brunette it's very blonde to me and I'm excited to be back over to the light side. When I first started this blog, nearly seven years ago I had a white blonde hair that I absolutely adored. But man was it hard to maintain and on a university students budget it really wasn't very obtainable for me to have such high maintenance hair. So now I'm a bit older and don't have hair in the same condition as straw it's actually pretty fun to discover how to not only keep my hair as bright as possible but healthy too. For some unknown reason, I've never put too much importance on shampoo, I just thought any old thing would do but how wrong I was. Since colouring my hair I remembered that you have to pick your product wisely and something I'm a big advocate of is a good clarifying shampoo. Of course, this isn't something that you can use a lot when you have coloured hair as you don't want to strip it of your colour but there are some colour safes ones out there now. Personally, I really like this one from Bioderma* and this one from Tropic*. Making sure my hair is actually clean means I have to wash it less which is much better for our tresses and my colour is brighter too. As I'm such a big lover of leave in products and a boatload of texture spray I do have to be careful of build-up as it mounts up pretty quickly and then I'm left with some seriously sad lifeless locks that are incredibly difficult to style. Matrix So Silver Shampoo*: I mentioned this shampoo in my last hair care post but I'm still using but now I'm blonder than I need to use it a little more. This is what I reach for when I wash my hair and I'm only going to be using one shampoo as it not only helps keep my blonde fresh but it gets rid of any dirt and grime too. When I use this my hair never feels stripped of moisture which can easily happen when using something like a purple shampoo as well as lovely and clean too. This was one of the only purple shampoo's that I see a big difference from instantly, I used it seven years ago and I'm still using it now which really says something about my loyalty to it. Infuse My Colour Platinum Wash*: After I use something clarifying to get rid of any build up then I will reach for this product which is a very concentrated toner. I wouldn't say it's really a shampoo and more something to mix with your shampoo of choice or use as a dedicated treatment. When my hair is looking really brassy or I've spent a little too much time in the sun then I will reach for this and it works beautifully. My blonde looks fresh and ashy but it doesn't leave any purple tones or a slight blue rinse look to my hair. And even though it is so concentrated my hair doesn't feel dry or fried and still has a lovely sheen to it. As it's so concentrated you only need a small amount so even though it is pricey it will last for months. Lee Stafford Coco Loco Hair Oil*: I absolutely adore coconut oil for my hair but you have to be so careful with it weighing the hair down [you have to use something clarifying if you're going to use it] which is where this comes in. It's a coconut infused hair oil but it's really lightweight and you only need one squirt to reap the benefits if you have hair a similar length to mine or maybe a pump and a half for anything longer. It leaves the ends feeling smooth and nourished without a hint of grease. It's all too easy to fear oils but when used in moderation they can work wonders. Matrix Colour Obsessed Miracle Treat 12 Lotion Spray*: Whenever I've been using any type of heat on my hair then I've been reaching for this product. It's a do-it-all spray that you can use for a number of things but I love it as a heat protectant. Not only does it help my hair become a little less damaged from the heat but I also find it helps to keep my curls in for a little longer as I certainly do struggle with keeping them in, especially when it's humid. Often I find products like this can leave a slightly sticky residue to the hair but this doesn't happen when I use this, no crunch either! 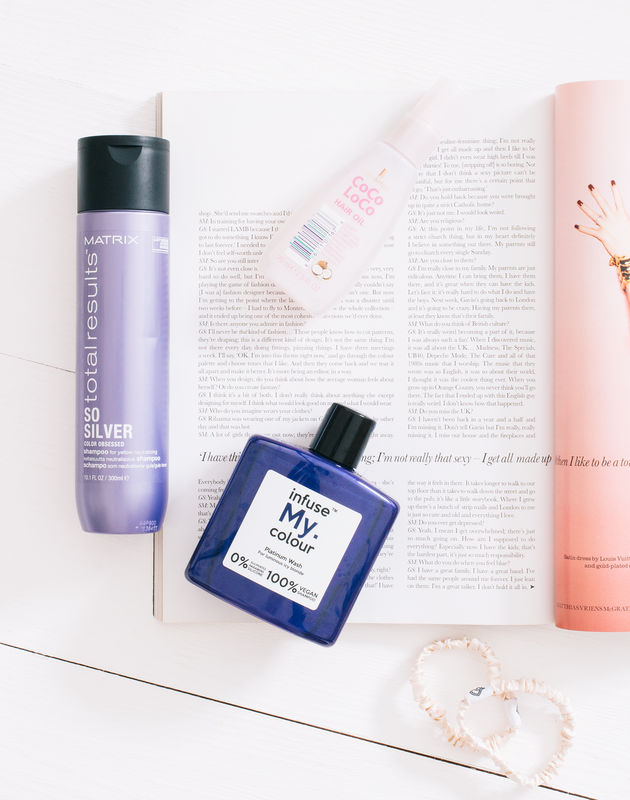 What are your favourite blonde hair products?